Originally published in 1854, "Walden," or "Life in the Woods," is a vivid account of the time that Henry D. Thoreau lived alone in a secluded cabin at Walden Pond. It is one of the most influential and compelling books in American literature. This new paperback edition--introduced by noted American writer John Updike--celebrates the 150th anniversary of this classic work. Much of Walden's material is derived from Thoreau's journals and contains such engaging pieces as "Reading" and "The Pond in the Winter." Other famous sections involve Thoreau's visits with a Canadian woodcutter and with an Irish family, a trip to Concord, and a description of his bean field. 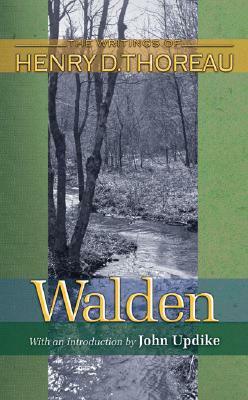 This is the complete and authoritative text of Walden--as close to Thoreau's original intention as all available evidence allows. For the student and for the general reader, this is the ideal presentation of Thoreau's great document of social criticism and dissent. John Updike is a Pulitzer Prize-winning novelist, short story writer, and poet, internationally known for his novels Rabbit, Run (1960), Rabbit Redux (1971), Rabbit is Rich (1981), and Rabbit at Rest (1990). He lives in rural Massachusetts.